Central came away with a lopsided win over West York in the opening night of the YAIAA playoffs. Central York knocked West York to the ground from the start Friday night and never allowed the Bulldogs to climb off the mat, breezing to a 62-38 victory in a YAIAA boys' basketball tournament quarterfinal Friday night at Red Lion. Central (20-2) advances to the semifinals where it will lock horns with Eastern York, a 59-46 winner against York Catholic, on Tuesday at Red Lion. The Panthers defeated the Golden Knights, 61-41, on Dec 5. "We beat Eastern when we played them earlier this season. 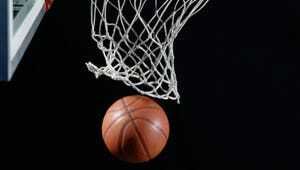 But they're a capable team, and they're playing better now than they were then," Central head coach Kevin Schieler said. "They just beat a very good York Catholic team tonight pretty convincingly." The Bulldogs missed all nine of their field-goal attempts in the first quarter and turned the ball over four times in falling behind 16-4 after the opening stanza. All told, West York was off the mark on its first 15 shots and didn't score from the field until Terry Cains' hoop with 2:03 left in the first half that made the score 31-8 in favor of the Panthers. "This is called, 'Throwing up all over yourself.' That's what happened to us tonight," West York head coach Bill Ackerman said. "We looked like we had never played basketball before for the first 14 minutes of the game tonight. Give Central credit, they defended well. But we were bad. There's nothing we can do about this but flush it and get ready for districts." West York (12-8) will continue its season in the District 3 Class AAA tournament. The Bulldogs are tentatively set for a first-round matchup against Berks Catholic, according to the district's final power rankings released Friday. Central received five 3-pointers from Nathan Markey in the first half and carried a 36-12 advantage to the locker room. "Nathan did a great job of getting us going tonight," Schieler said. "He shot the ball very well and we shot well as a team." The Panthers shot 25-of-55 (45 percent) from the field and 9-of-21 (43 percent) from beyond the arc. 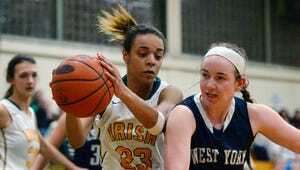 West York tried to stage a comeback in the third quarter, getting as close as 42-24 when it ran off eight straight on a run capped by a Darian McCauley hoop at the 3:12 mark of the stanza. However, Central righted the ship when Tommy O'Neill drove the lane for two with 2:30 left in the quarter, and the Panthers held a 49-29 lead going to the final frame. Central led by as many as 28 in the fourth quarter. The Panther defense limited West York to 11-of-46 (24 percent) shooting and forced 14 turnovers in the game. "One of our goals was to outwork them at the defensive end," Schieler said. "That's no easy task, either. They work very hard at both ends of the floor. So I was very impressed with the effort that our guys gave tonight." In addition to his 19 points, Markey added seven rebounds and three assists and Jared Wagner put in 14 points. McCauley paced the Bulldogs with 14 points. Fields 1 0-0 3, Hawkins 0 0-2 0, Bailey 2 2-2 6, Cains 1 0-0 2, Meckley 0 1-2 1, Lalic 1 3-4 6, Frey 2 0-0 4, Sarver 1 0-0 2, Geller 0 0-0 0, Darian McCauley 3 7-8 14, Linton 0 0-0 0, LaManna 0 0-1 0. Totals 11 13-19 38. Batts 2 0-0 5, G. Markey 2 0-0 5, Ray 0 0-0 0, Hunt 0 0-0 0, Edmonds 4 0-0 9, O'Neill 1 0-0 2, Becker 0 0-0 0, Krentz 0 0-0 0, Pribula 0 1-2 1, Nathan Markey 7 0-0 19, Richards 0 0-0 0, Jared Wagner 6 1-4 14, Sobestanovich 2 1-1 5, Czulada 1 0-0 2. Totals 25 3-7 62. 3-point goals - WY 3 (Fields, Lalic, McCauley), CY 9 (N, Markey 5, Batts, G. Markey, Edmonds, Wagner).